- Language issues: India is a diverse country with many different languages. And for a person like me well versed only in Hindi and English, it becomes a struggle to speak with any artisan, especially on the phone. I recently tried to contact an artisan who was making beautiful unique kantha work designs on silk stoles and dupattas. I tried, in many different ways, to convey to him that i loved his work and wanted to buy his stock. After many unsuccessful attempts he managed to make me understad that his nephew, who spoke Hindi, would call me. But that call never came. -Literacy issues: One of the biggest deterrents to growth in our country. 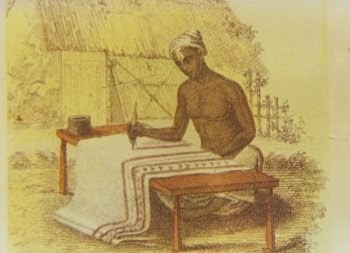 Many artisans are illiterate and thus have no way of communicating on sms or email. Come to think of it if they could do that, they could directly list their products on so many marketplaces! -Technology issues: Artisans are mostly located in remote villages where smart phones have not made inroads yet, or even if they have, enablers like whatsapp have not. So the artisan has no way of showing me the products he has, so that i can place an order. There is an artisan in a remote village in Andhra, who is a national award winner in the art of Tholu Bommalata- the art of painting on leather. But sadly, he is never able to show his designs to me so i can place an order. I read somewhere that an African marketplace called Soko has actually got into developing an easy to use smart phone application, using which artisans in the remotest villages of Africa are uploading their products on the marketplace. What's more, they are empowering the artisans by not only providing them phones, but also training them on using the application as well! -Work ethic: At times I have been lucky enough to find artisans well equipped in all of the above. But sadly, their work ethic and adherence to timelines is well, very very different from ours. I came in touch with a lady who makes beautiful, very unique designs in phulkari dupattas and sarees. I placed an order of 50 dupattas with her. But the deadline came and went, nothing happened. The lady was of course, not able to comprehend my sense of urgency at all because time flows at a different speed, where she comes from. Eventually when my follow-ups became too frequent and insistent for her she said to me 'I will not deliver your order. Do what you want.' And that was the end of that. Thankfully, I had not paid her an advance, so the only thing that was dented apart from my pride was my resolve to get the artisan in the picture. So till then the answer to queries like the one that lady put to me will be 'Work-in-Progress' :) We will try to get into solving various aspects of this problem, in subsequent posts. Do share your thoughts! In India large number of Artisians exists but they are not getting proper benefits form India and thus their skills are dying. For example weaving is very common skill and mostly followed by people living on the banks of Rivers of India but due to lack of market many has left the traditional business.